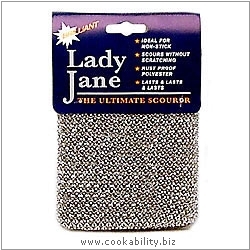 Unique scouring pad that's ideal for all types of cookware including stainless steel and non-stick surfaces. A firm favourite of our Web Designer! Scours without scratching. Rust proof polyester. Top quality UK version. Not recommended for use on brushed metal. Overseas orders welcome. US customers. 20 is the optimum quantity to order for reasonable Airmail cost. Please ensure your bank will permit an overseas transaction! Please note this product and the later, rebranded, Vim version have been discontinued. We are now supplying a pretty much identical version sourced in the UK to the same specification but with different packaging.